Women – can you love yourself more? I was shocked and saddened by a passing conversation I had recently with a mother of a 3 month old baby. He had developed eczema in this last week and hers had returned after a week of a new weight-loss diet she had started. Her GP had prescribed steroid cream for the baby’s eczema. I suggested that it might be something to do with this diet and that maybe if she switched back to what she was eating before it might clear up again. However, she was off on holiday next week and needed to get her “bikini body”. So she said she was going to have to use the steroid cream because she needed to lose weight more than test out the theory that the eczema was diet related. Now I’m not relaying this story to judge this woman. She is a product of our joint western female upbringing. What can we do to start loving our physical body again? We could take the focus away from how we look and ask ourselves – how does my body feel? Does it feel loved/nurtured? Am I hungry/full? Can I move as easily as I would like? Would I like to improve my flexibility? Am I looking after myself emotionally? Do I need more support – physically/emotionally? We could stop commenting to others altogether on how we look/how they look/how other women look. We can stop judging women on their looks altogether. This isn’t good for you or other women. If you hear yourself (inwardly or outwardly) judging another woman on the way she looks, how large/small she is; what she is wearing etc – I guarantee you that you are also doing this to yourself. The external world is reflecting back to us our inner thoughts at any given time. Compliment yourself and other women on their kindness, compassion, loving behaviour, accomplishments, achievements. We could ask ourselves the question – what can I do that will show me that I love myself more? Do you need more time alone/quietly; with friends; with your partner; a relaxing bath; a massage? Physically pampering your body in a loving way that feels good is a great idea. Collectively, women need to reclaim their power back over their physical bodies and inner strength. We are important, valuable, necessary, worthy, passionate, creative, powerful and needed in this world – just the way we are and in spite of our physical appearance. 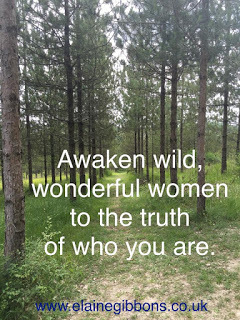 Reclaim your female power and inner strength now.